We’re going to be rushed off our feet in the cellar this week with our Syrah coming in and we realised you haven’t heard from us in a while. 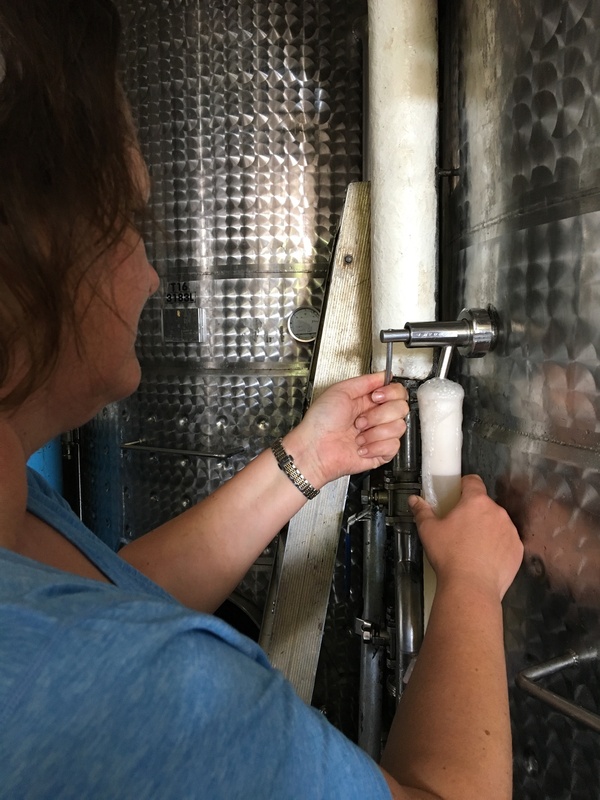 Earlier this year we were joined by Annabel Stonor from the UK as part of her sabbatical (and voyage into the world of wine) and we thought you might like her take on wine, South Africa and her time with us. What’s your favourite varietal and why? Pinot Noir – I am a big fan of Burgundy and have tasted so many wonderful wines there, but have also enjoyed it from other regions, such as the Yarra Valley, Oregon and South Africa, of course. I think what I like so much about it is that as well as producing relatively simple wines, it can also produce some wonderful, elegant, complex secondary and tertiary flavours. I wish I could keep it long enough in my home or afford to try more aged Pinot! If you could drink only one bottle of wine .. what would it be? That’s such a difficult question! Given my preference for Pinot, I think it would have to be a bottle of aged DRC as I will never be able to afford to buy in real life and I’d love to see whether it lives up to the hype! Favourite food and wine pairing? A South African braai and Kershaw Elgin Syrah, of course!! Why are you interested in the wine industry? My father has always been into wine, and so I’ve been brought up hearing about it from an early age – in fact, when asked to do a presentation as as 17-year-old at school on a subject of my choosing, I elected to speak on the wine regions of France and my housemistress gave me a book on wine as a leaving present. Having started studying wine a few years ago, I just find it more and more interesting the more I learn. To be able to hear how the terroir and other factors influence what you’re drinking is fascinating. The more I learn, the more I want to learn and to actually be involved in the process is a dream. Of course, tasting it isn’t too bad either! What did you think of South Africa? I fell in love with it! I have never been to Africa before and I was blown away by the beauty of it. I drove over 3,000km while I was there and just wish I could remember all the beautiful sights I saw – I have some immortalised in film, of course, but it would be impossible to capture the feeling of the country without actually being there. The people are also wonderful and friendly and, of course, the food and wine are exceptional – I have never eaten so many oysters and prawns in my life! I visited some amazing wineries too and the winemakers were always fascinating and keen to talk about their wines. Favourite and least favourite job while visiting us ? 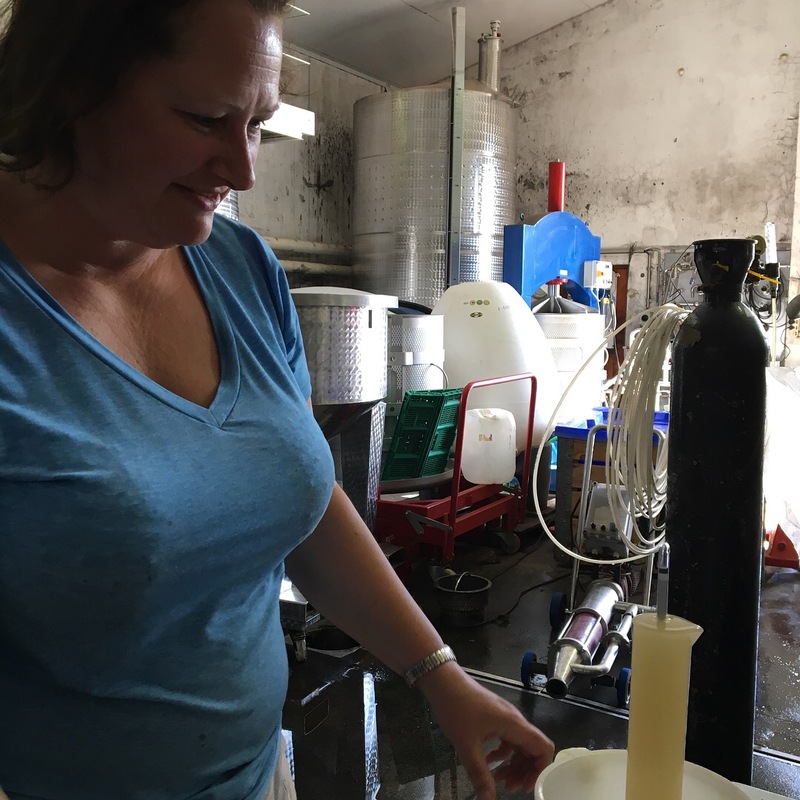 I think my favourite job was being involved in the whole process of fermentation as I was there during the 2018 harvest. I learnt so much – with Richard and Dudley imparting their knowledge, I really felt lucky. I enjoyed all the work, but I think Richard would agree that the job I was probably least proficient at was stencilling the wine barrels with the necessary precision!! I am going to be helping out at a winery which produces sparkling wines in Sussex in the UK for a few weeks, but this time on the front-of-house side, helping with tastings and vineyard tours. I am on sabbatical from a job in the finance industry, so I will be returning to that in a couple of months’ time, but I would love to work in the wine industry, preferably using some of the skills I have learnt in my current job, such as process implementation, organisation and data analysis, while still helping out in the winemaking process as well. From the team, we wish Annabel all the best as she now heads to the next stage of her wine journey.